Dow Jones surged 23 points to 10968, it is another 5-month high.Profit taking activities kicked in and capped further rally on the Dow after an unexpected drop in September ADP report and IMF’s cautious economic outlook in 2011. The Dow ended flat with a 23 points gain amid a loss of 39k private sector jobs last month (consensus: +20k). The news comes ahead of the closely-watched monthly jobs report due Friday. Meanwhile, the IMF said a double dip recession is unlikely, but global economic growth will slow from 4.8% this year to 4.2% in 2011. Investors continued to shed defensive assets, and commodities rallied, with crude-oil futures closed 0.8% higher at US$83/barrel, while gold futures ended +0.5% at yet another record high of US$1,346/ounce. Treasuries surged,sending 10-year yields to a 52W low of 2.40 (-0.7 bsp), while the yen reached a 15-year high versus the dollar at 82.77. 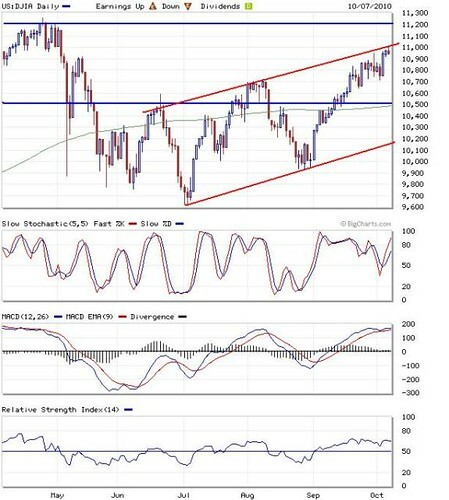 On Wall Street, the near term outlook turns brighter as the Dow Jones is testing the upper UTL (up trend line) channel as sentiment is boosted by expectations of additional quantitative measures by FED to stimulate the economy. Meanwhile, should the highly focused September non-farm payrolls report (October 8), as well as the forthcoming 3Q2010 earnings season (starting with Alcoa tonight) do not disappoint market expectations, we may see further rally to retest its 52-week high of 11309. Supports are situated at 10500-10600 points. Daily Dow Jones indicates that it is trying to breakout above the uptrend channel.